The stock market has so far put in a spectacular bull run during January 2013 by putting in a series of new stocks bull market highs across virtually every major indices and this taking place whilst the hottest stock of 2012 having collapsed by 1/3rd - Apple. No one could have imagined that the major stock market indices could make a series of new bull market highs whilst the biggest cap stock was in free fall! Where Apple is concerned it is clearly a case of Samsung having pricked Apple's stock price bubble that looks set to have much further to deflate. If the stock market momentum continues at the current pace then the stock market will be up by more than 50% for the year! Off course that is not going to happen, realistically no matter how good such a move would be for our stock portfolio's, I am pretty confident that this mature bull market (near 4 year old) is unlikely to see the stock market up 50% for 2013, especially as the major indices are homing in on major psychological levels such as Dow 14,000 (last 13,954) and my long standing target of 14,200 (Stocks Stealth Bull Market ebook March 2011). Another point to note is that the rally underway has witnessed delusional bears right across the globe literally being seen as foaming at the mouth as illustrated by the diatribe that continues spew out of commentary of an always imminent bear market, crash, collapse etc... When the reality is that not only have they and everyone who listened to them missed out on what is a stocks bull market that is approaching the END of its FOURTH YEAR ! But that have been actively betting against an exceptionally strong recent bull run that is the exact mirror image of the crash that they have been so furiously proclaiming as always being imminent. The Dow closed up a healthy 7% for 2012 at 13,104, whilst other major indices adding substantially more such as S&P: up 13% and Nasdaq up 16%, with the UK FTSE trailing with a 6% gain. In terms of the long-term view my analysis of March 2011 (Stock Stealth Bull Market Ebook) (FREE DOWNLOAD) concluded in a target of Dow 14,200. However as regularly indicated since Mid December 2011, in view of expectations for a tough year for a maturing stocks bull market during 2012, my strategy for the first half of 2012 had been to cut my net long exposure to the stock market from about 40% of assets (Dec 18th) by distributing into the anticipated rally into late April / Early May 2012 as indicated by the analysis and forecast of Feb 2012, which resulted in substantially cutting my exposure to the stock market by mid year. The fundamental background remains of ever expanding waves of highly inflationary central bank money printing liquidity that washes over all markets. Deflationists such as Krugman and his disciples bang on and on about deflation, about destruction of demand, that will result in deflation, about debt deleveraging that will result in deflation. What the deflationists remain blind to is the fact that the central banks such as the Fed, and the Bank of England have been stuffing every orifice of the deleveraging banks with free money ( US alone has stuffed its banks with over $2 trillion of support) which results in artificial profits as the banks risks / debts are being systematically transferred to the central banks balance sheets. Which is WHY FALLING DEMAND and FALLING WAGES are NOT resulting in Deflation! because in totality, there HAS BEEN NO DEBT DELEVERAGING, TOTAL DEBT IN FACT CONTINUES TO EXPAND as central banks MONETIZE GOVERNMENT DEBT and in some cases EXPOENENTIALLY. And not only that but money printing AKA QE is far worse for an economy than Debt money (bank created credit) because it REALLY has just been conjured out of thin air with no economic activity to justify its creation. This is why prices WILL rise, ALL prices including asset prices because of central bank QE which should not just be seen as free money for the banks but direct deliberate debasement of the currency. Unlike bank credit It WILL NEVER be destroyed instead feeds the Inflation Mega-trend which I termed in March 2009 as QE really being Quantitative Inflation. I know this may be getting rather complicated, so if you want to understand only one thing, know this that money printing by central banks is highly inflationary, highly corrosive to the purchasing power of a currency, which is why despite all of the academic reasons why we 'should' have deflation in reality we have INFLATION. 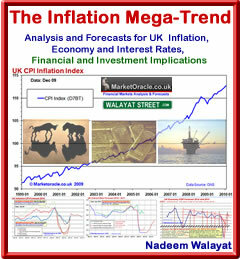 The Inflation Mega-trend Ebook of Jan 2010 (FREE DOWNLOAD), re-iterated that asset prices tend to be LEVERAGED to Inflation, which is precisely the trends that have subsequently transpired from stocks to commodities such as Gold and as I have been flagging during 2012, is expected to transpire US and other housing markets so it does not really matter if actual inflation is far higher than official inflation which means it is not necessary to focus on alternative inflation measures if one acknowledges that asset prices tend to be leveraged to official inflation data that go through the stages of being over sold or over bought against inflation due to the impact of investor sentiment. Again note that the Inflation Mega-trend is EXPONENTIAL, and no matter how loudly the delusional deflationistas scream for always imminent DEFLATION, it is just NOT going to happen, if anything government actions i.e. QE-4EVer is going to result in the ratcheting higher of the the Inflation Mega-trend going forward. Frankly, I just do not understand why so many people that purport to be experts on the financial markets can remain so blind to what is blatantly so obvious. The only logical conclusion is that they never put their own money on the line and thus never face the financial consequences (PAIN) for being wrong, for had they followed their advice such as betting against a near 4 year bull market then they would have already bankrupted themselves several times over by now, but instead merrily go around spouting what amounts to nothing more than verbal diarrhoea. Fortunately for them I don't see it as my job to expose the abysmal record of media whores who tend to spend more time in front of TV camera's than trading screens. Another factor to consider is speculators from individuals to the mega- investment banks see what the Fed is doing and are attempting to discount future market action to this ongoing policy of market manipulation by the Fed, by reacting far beyond that of the nominal amount of $85 billion suggests, which is one of the reasons why the stock market is rising as the trend feeds on itself. My quick answer is because they will keep printing money, which causes inflation and inflation is the stealth theft of wealth and purchasing power of a system that has its basis in fraud. If the person is still listening then I explain that the whole system which includes the stock and other markets is fraudulent. We do not live under capitalism we live under a fraudulent money printing bankster system. The politicians are in the back pockets of the bankster elite. The reason why stocks will rise is because the system is corrupt, the markets are manipulated. The regulators and the politicians are corrupt, which is why the banks were bailed out, privatised profits, nationalised losses, why we have zero interest rates, why the government prints money (debt / QE / Loans), and the mugs are ordinary tax payers. You pay the price for systemic corruption, you pay for the bailouts whilst the bankster's collect bonuses for fictitious profits. You pay for the regulators who operate a revolving door with the bankster institutions, it is not by accident the regulators were snoring whilst the banks were committing fraud. You pay for the politicians who after leaving office go work for bankster's. You pay for the fraud as it manifests itself in exponential inflation. We are all slaves and 99% are not even aware of their slave status! The politicians need the bankster / elite money to get elected. The politicians know their term in office is limited i.e. they could be voted out at the next election so as soon as they get elected they start working on what they will do when they get voted out so work towards that goal by favouring the elite in their policies, which is why the tax payer bailed out banks have NOT been nationalised. We the tax payers OWN the big banks but have NO control over them! That is FRAUD! THE ELITE OWN THE POLITIIANS OF ALL PARTIES! The apparatus of the state exists to perpetuate the fraud. The intelligence agencies exist to perpetuate the fraud.the whole public sector exists to perpetuate the fraud. The state schools exist to perpetuate the fraud to churn out docile debt slaves to work for there elite master's. Don't take my word for it, analyse how you as tax payers work ever harder for ever decreasing disposable income, where you are forced to fill the gap with debt, i.e. you are forced to become a debt slave. This is not by accident this is as a consequence of from cradle to grave conditioning. Virtually All government produced economic statistics are fraudulent - Of course real inflation is far higher than official CPI inflation, I know that and so do you when you do your weekly shops! For instance, I estimate current real UK inflation to be at 4% against official CPI of 2.7%. That may not sound like much of a difference but compound it over a decade or so and that explains why your rising (if your lucky) wages are unable to buy the same amount of goods in the shops let alone more. That's the point about the inflation theft, it is meant to be STEALTH. The same goes for all other major economic statistics that Economists tend to ecstatically convulse over - Take GDP, the government SPENDS to inflate GDP without any real productive output, not worth even 1/10th of the amount spent, and it is this that causes inflation because government activity consumes resources without generating productive activity. Spending billions or even trillions as with the case with the Iraq War, to send thousands of troops over seas to kill brown people may boost domestic GDP via the military industrial complex, but it is not productive activity which is why it causes INFLATION. This is despite all of the technological innovation of the past 40 years, ordinary people today have to work far harder then their predecessors did for a similar quality of life, instead technological innovation should have resulted in a majority leisure life-style by now, after all that was the forecast from the early 1980's that the technology would so boost human productivity that it will mean we will all only need to work about 10 hours a week by now and spend the rest of the week enjoying ourselves in leisure activities. What these forecasters forgot was that the thieving scum bags on capital hill and at Westminister would steal virtually all of the gains in productivity and transfer it to vested interests and the elite. So the governments will continue to print debt and money to buy votes and make wars to justify their existence and expansion the consequences of which is for ever expanding taxes and the inflation stealth theft of wealth and purchasing power of earnings. Unfortunately most people remain sedated as they swallow the propaganda from vested interests across the mainstream media and broader hollywood programming, as they load themselves up with debt and then become focused on working for the elite to to service the debt for the rest of their lives as each election they put their mark against the party who offers them the biggest bribes (a part of their own money back). So yes, assets that are not so easily printed will continue to leverage themselves to the money printing inflation fraud that will continue to exist whilst big spending governments exist ( as a high % of GDP). Those that follow the prevailing doom and gloom in the mainstream broadcast press will be under the impression that we must have been in a severe bear market, instead the reality has been the exact opposite, a severe bull market has been underway for 4 years now that the mainstream press has all but missed if not actively been implying the opposite, be it the latest diatribe that suggested the markets would collapse following Obama's re-election, or the prospects for eurogeddon for the whole of 2011 AND 2012. This reinforces a fundamental point that whilst the mainstream press collectively remains clueless to bull trends underway then those trends are likely to continue. Conversely when the mainstream press is actively seen as turning bullish on an asset class then the time has come to SELL. I have explained the reasons why this is so countless times over the year so will refer to an earlier article on this subject that explains a wider truth of Why 90% of Traders Lose. The failure rate for financial market and commodity traders has remained at a consistently high 90% for many decades, this despite all of the advances in information technology and the flood of new learning materials that is churned out annually, therefore why is it that 90% of traders still lose ? In my opinion, a high 90% of traders are destined to lose because they are in fact learning from / listening to the 90% of losing traders that preceded them, who following wipe out in the markets have gone on to focus on writing about market price action and methodology with an even greater concentration observed to occur in the mainstream press as account busted traders / investors turn failure to trade into full time media careers and thus perpetuate a continuous cycle of failing traders guiding new traders towards similar failure. This explains why those in the mainstream financial press can literally miss WHOLE Bull and Bear markets despite trends that end up spanning many, many years. They can be recognised by their rhetoric such as the perpetual the end of the trend is coming mantra that is based on fundamentally flawed understanding of what actually moves markets, which is why they failed to succeed in trading in the first place. Given that 90% of trader fail, it can be assumed that that at least 90% of those that provide financial commentary are failed traders that spend their time writing about the act of trading rather than ever engaging in actual trading which culminates in the big name media whores that we see prancing around between make up rooms and TV Studio's, usually regurgitating what other failed traders have already commentated upon or make such weak statements that can be easily applied to virtually any outcome i.e. that the market will definitely fall, but then again it may definitely rise. The media whores are well practiced in applying such phraseology that ensures that they can always claim victory for publicity purposes whatever the actual outcome is, as the viewers are left to perceive whatever they want to in the media whore sales men's commentary, based on their own pre-existing market bias. The mainstream financial media is more than eager to push the selectively edited past commentary that results in nothing more than blatant misleading advertisements masquerading as financial market commentary. Stop for a moment and dissect what the latest utterance of a media whore actually is and you will soon realise the game of deception that is being played in an attempt to hook you in towards ultimately purchasing a product or service. In actual fact perhaps as little as 1% of the material floating out there is produced by successful traders because successful traders are primarily going to be focused on trading rather than writing about trading or marketing trading services, with probably only enough spare time to write a couple of books over their whole lifetime which compares against the book factories that can churn out as many as several titles per year that virtually ensures that at least 95% of your trading book shelf is packed full of garbage, totally useless, and you know it! Still it could be worse, academic economists inhabit a zone that is based purely on mumbo jumbo that is guaranteed to result in unforeseen outcomes, for academic economists tend to be the second greatest media whores just a step down from politicians, who exist purely to give off the air of authority and certainty as though economics is a science when in reality it is pseudo science more akin to the art of psychologically managing the general populations expectations aka economic propaganda than in determining any sense of economic reality. Economic theories are just that theories that have been modeled on selective editing of past economic data for political purposes which every trader should know (failing or successful) is just over optimised back fitting onto selective past trends that proves totally worthless going forward. The bottom line is this that wealth can only be created by means of competitive productive activity, the greater the competition the more productive the activity. Whilst for governments the objective is to expand uncompetitive unproductive activities which is what the public sector that seeks to consume wealth. The most extreme manifestation of this is the military that we have all so successfully been brainwashed to embrace as hero's to look upto as they go around playing drone wars or flying apache gun ships. Note that military activity is the greatest wealth destroyer mankind has created, far surpassing government bureaucracy, for all empires are ultimately destroyed through military over stretch, that is why the empires of past such as the Roman and British Empire's collapsed as the military destroyed more wealth than the private sector was able to create. For empires such as the Soviet Union was even more crippled because their productive capacity came from keeping virtually the entire population as slave workers, even that was not enough to prevent military meltdown as the military industrial complex sought to consume all of soviet unions productive capacity that resulted in its destruction. So we have wealth destroyers - the Military, Wealth wasters - the Public Sector and the Wealth creators competitive private corporations (not to be confused with monopolies or bailed out banks). Therefore if you want to increase your wealth then you need to be exposed to the competitive wealth creators, selecting sectors and individual stocks that are most geared towards wealth creation such as Tek Stocks, commodities, and other innovators. The bottom line is that the wealth creators, cloth, feed, and entertain us. Without whom we would be where the Russian people were during the 1980's, the Chinese people were in the 1970's and the British people were in the late 17th century before the most potent force that mankind had invented emerged - Competitive Capitalism! Something that the British governments successfully nurtured that resulted in Britain being able to finance the largest empire in history. That during the 20th century successive British governments have sought to corrupt with increasing socialism that translates into getting something for nothing, that has led to today's position where Britain has let itself become a small Island adrift in the Atlantic ocean that amounts to nothing more than an air-craft carrier for the United States Military Empire. Clearly Capitalism is more than just an human idea, it is a force of nature, for it has its roots in the ultimate form of competition which is evolution, survival of the fittest, stress literally breeds innovation, competitive life seeks to spread to every corner of the globe. It should be the governments job to nurture competitive capitalism not subvert it with socialism that seeks to reward incompetence, seeks to bailout the bankrupt, seeks to avoid cleansing of malinvestments from an economy. Big government IS the reason why we are ALL suffering today! Why we have Inflation! For without big government socialism then we would have DEFLATION as innovation results in FALLING prices, but instead we have EXPONENTIAL INFLATION as a consequence of the FRAUD that is the Government ! 6 MILLION PEOPLE in BRITAIN are PARTY to the FRAUD! (public sector works). A further 8 MILLION PEOPLE who could work are instead kept sedated on benefits, wasting their whole lives away. THAT IS THE REASON FOR OUR ECONOMIC CRISIS. You want to see the mother of all economic booms ? Scrap the public sector and cut the benefits and see what happens to the economy! But no greedy lazy, good for nothing fraud perpetuating politician is every going to go down that route instead all they will ever do is grow the size of the state, all the way towards bankruptcy. The Government left to its own devices will seek to consume all of the wealth in an economy i.e. bankruptcy, that is most likely to manifest itself as an hyperinflation panic event. Next I will explain why despite everything I have said above, we are NOT doomed! You Want to Know the Future of innovation ? The water and steam engine revolutions of centuries past show the direction for future innovation will be in levers and motors for future machines, only that these machines will be on the nano scale. Therefore that is the direction that investors need to research for greatest leverage to future competitive wealth creating technologies such as nano-technology, levers and motors, the building blocks for nano-machines, and nano-machines will become self-replicating that will seek to change the whole world, just as the internet has. The wealth that this will create will be exponentially greater than all of the wealth that has been created to date, as an example the nano-tech world will be as we today look back at the pre-personal computer world of less than 40 years ago. When we watch a 1970's movie we automatically wonder at how bare their existence was, where's the mobile phone, where are all of the computing devices ? That is how we will see today 30 years from now ! And thus the wealth this creates 'should' be more than enough to be able to feed the wealth consuming monster that is big government. Then armed with nano processing devices that are exponentially more powerful than today's super computers we will answer the really big questions! Such as - What is Life ? Not some babbling's contained within ancient scripture written to control the masses towards an elites agenda. But what IS life at its very core. To know the answer to that we will CREATE life and I am not talking about today's technology of genetic engineering but creating life right from its very first spark! Which is important because it opens up the possibilities of creating life that is completely alien to that which exists on earth today i.e. life that is metallic rather than organic. The past decade has already revealed what organic life is and how it began but lacks the technology to experience its actual creation. However 30 years from now, we will likely find that high school children will be able to CREATE LIFE as part of their science projects! The transformation of energy as per the laws of physics - 4 billion years ago proton gradients drove the conversion of carbon dioxide into organic molecules and the rest is as they say history. A recent BBC programme "Wonders of Life" illustrated the process in an excellent non technical manner, which may still be available on BBC iplayer. Future technologies will result in an exponential increase in human productivity because we will be able to re-create what took 4 billion years in a matter of days or even hours, which will set the scene for the yet to be named new sciences and spark the next technological revolution after nano-tech, one that will be centred around creating life from the ground up, right from the first spark and thus giving it properties not found in nature today. So the debt deflation collapse merchants that keep their eye on the likes of the government debt statistics will remain waiting for an always imminent collapse for what will seem like an eternity. Again it is important you understand the overall big picture of one of exponential inflation as a consequence of government money printing fraud and the technological human productivity boosting mega-trends brought to competitive markets around which asset price booms and busts oscillate ever higher. Therefore investors need to protect themselves from Government wealth consumption (taxes) and inflation (loss of purchasing power) by channeling their wealth into assets that are leveraged to wealth creating innovation (technology stocks) and are tax efficient such as ISA's in the UK. In part 2 (this week) I will seek to conclude in a detailed trend forecast for the stock market for the whole of 2013, ensure you remain subscribed to my always free newsletter to get this and other detailed trend forecasts in your email in box. In the meantime, if you have not already done so then check out my other recent concluding trend forecasts for 2013. 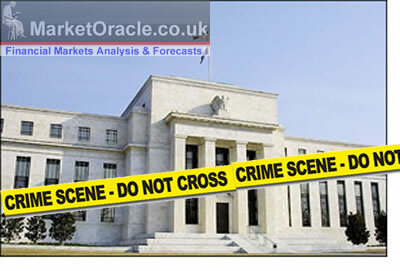 Gold Price Forecast 2013, Buying Opportunity?, is Silver Cheaper? Also Ensure you are subscribed to our new youtube channel for video versions and educational material. You are exceedingly wise, why have not the PTB arranged for your demise. www.BERTAN10.com , I am fighting an uphill battle trying to get the Republiscrats to nominate me for Congress. Brilliant article. You have nailed the general market action very well for several years running. Very impressive. I love your description of the players within the system as well. You have summarized my views on the whole system perfectly. One question I have is what happens beyond the inflationary mega trend? Printing can go on for a long time but at some point things will get bad enough on mainstreet that the sheeple will start searching for answers and might attempt to inform themselves. What then? Revolution? War? Will TPTB ever have their inflationary wings clipped? Or does inflation continue forever? Thanks for your thoughts. History suggests (3000 years) that inflationary mega-trends are exponential as all governments go down the SAME route of either buying dissent or liquidating it. In our age, they will continue to buy dissent and inflate, that is what has got us to have a benefits culture in the UK, this looks set to continue all the way towards an hyperinflation panic event. I do not know when this will happen, all I know is that it is not imminent and probably unlikely in this decade as I explained why in the article. So those waiting for hyperinflaiton for the UK and USA will probably also be sat with their deflation bretheren be waiting for what seems like an eternity. However having said all that i.e. that there is no trend for hyperinflation. There is however an increased RISK of hyperinflation which is somethings the journalists and academics cannot comprehend beause they do not TRADE. The risk of an hyperinflation event is INCREASING, if I had to quantify it I would say its around 10%. Which may not sound high but it is a lot because the consquences of hyperinflation would be total economic collapse which lies at the root of our economic problem in that those that put policies into action or commentate on it have NO CONCEPT OF RISK. for if they did they would not have started QE never mind be on QE4.... For instance I estimate my personal risk to ruin is less than 1%, beause there is no way I want to start from scratch at my age, whereas these government fools have loaded the global economy with a 10% risk of total ruin !